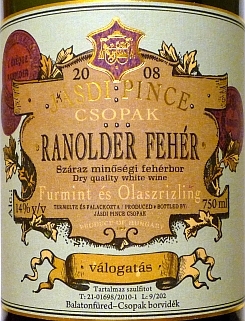 The White Blend named after bishop Ranolder is the top wine of the Csopak producer, blended from the old vines of furmint and olaszrizling of the Siralomvágó plot. A single reminiscent of an age long gone by, when Csopak wines were rated among the best wines of Hungary, commanding top spots and top prices on plush restaurant menus in the first half of the 20th century. Pale lemon hue, with a reserved nose of citrus fruits, some green apple, and a bitterish touch of white flowers. Round, but lively acidity,with a firm body. Much more bitterness on the palate, with citrus fruits, and firm tannins. A firm core, and good concentration, and a reasonable use of barriques, I suspect. Seems to have all the potential a well-supported, furmint blended, old vine olaszrizling can (ever?) offer. Probably a bit closed down at the moment, but I think it will be worth to look back in 3, 5, 10 years, at least. 92 points for the great structure, and the potential I suspect. Show a lot more if drank slightly warmer. I have just realized that TheEdAlc covered this wine precisely a year before me, and scored it at 7 points (worth ca. 90-91 here, promising more, if barrique tones retire with time). I found the picture in TheEdAlc post. Disclaimer: This wine was my own purchase from here. This entry was posted in White Wines and tagged 2008, Csopak, furmint, jásdi, olaszrizling. Bookmark the permalink. Right. I am most certainly interested in this wine. Ranolder reds tasted previously did not fail to disappoint. I am looking forward to drink this white in a few months time to recover grounds. I have been missing out on Ranolder reds yet, but Northern-Balaton reds are really an experiment at the moment. This one reminded me of a Silex on a smaller scale, impressing, though possibly divisive.